North West duo Boyd Rankin (left) and William Porterfield are in the NW Warriors squad for next week's to face Leinster Lightning. The North West have landed a bit of a touch on the eve of the new Hanley Energy Interprovincial series by naming both William Porterfield and Boyd Rankin in their squad for the 3-day game against Leinster Lightning at Pembroke next week. Ian McGregor had already indicated that Irish skipper Porterfield would hopefully be an integral part of his squad this summer but the inclusion of Rankin has taken many by surprise. Confirming the news this morning the Union’s General Manager Peter McCartney said that the pace bowler’s availability was a huge boost for the North West squad. “We were obviously thrilled to get William in and when it was mooted as a possibility about Boyd we did everything we had to in order to bring him as well. we are obviously very grateful to Warwickshire CCC for their co-operation and for releasing Boyd for the game,” he stated. “These are two quality international cricketers but as well as that they are north west lads too. they will know everyone in the dressing room and played with and against nearly all of them growing up here. “It means we have 10 North West players in our 12 for next week as well as Niall O’Brien who blended into the squad superbly last year. The new additions will also bring the number of full Internationals in the party up to seven- still some way short of their hosts, but catching up. Next week’s game has been moved from Oak Hill to Sydney Parade after concerns about the effect the recent bad weather had had on the Wicklow venue. 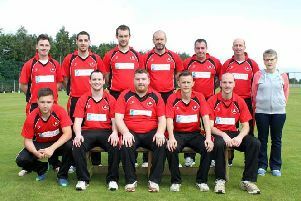 North West Warriors squad: Andy McBrine (capt); William Porterfield; David Barr; David Rankin; Aaron Gillespie; Niall O’Brien; Stuart Thompson; Ross Allen; Steve Lazars; Craig Young; David Scanlon and Boyd Rankin.